N,N-Dipropyltryptamine (DPT, also known as "The Light") is a psychedelic drug belonging to the tryptamine family, first reported in 1973. It is found either as its crystalline hydrochloride salt or as an oily or crystalline base. It has not been found to occur naturally. Frequent physical effects are nausea, numbness of the tongue or throat, and pupil dilation. Studies on rodents have found that the effectiveness with which a selective 5-HT2A receptor antagonist blocks the behavioral actions of this compound strongly suggest that the 5-HT2A receptor is an important site of action for DPT, but the modulatory actions of a 5-HT1A receptor antagonist also imply a 5-HT1A-mediated component to the actions of DPT. DPT changes Ehrlich's reagent violet and causes the marquis reagent to turn yellow. 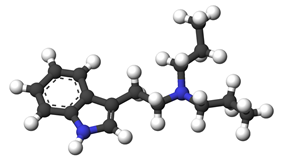 While dipropyltryptamine is chemically similar to dimethyltryptamine (DMT), its psychoactive effects are markedly different. The most prominent features of the DPT experience are increased significance or intensity of music, colors take on a new intensity or appearance, the body may have a buzz or vibratory feeling, a pleasant sensation of warmth, complete ego loss, apparitions of faces. While seeing other beings under the influence of DPT may occasionally occur, the perspective is more as an observer or watcher, as contrasted to the more personal real-feeling entity contact reported with DMT. Also sometimes reported is a loss of ego boundary; for example, the boundary between the self and a table may not be easy to distinguish. Difficulty distinguishing other boundaries is common as well. For example, different colors may be difficult to distinguish. Other sensory input may also become blended. This is distinct from synaesthesia. A user may also encounter the feeling of experiencing the life of someone else, or having had all possible experiences simultaneously. One may have the experience of seeing the universe from different locations in space and time. Visuals are often geometric, wavy, and/or spiraled. Other visual distortions and hallucinations tend to be experienced in the peripheral vision. The self or the environment may take on a stylized cartoon-like look or feel. Pleasant flashes of light and sparkles are also common. Negative side effects of human consumption of this drug (or drug being sold as DPT on the internet) can include seizures, increased heart rate, dizziness, nausea, and death. DPT is used as a religious sacrament by the Temple of the True Inner Light, a New York City offshoot of the Native American Church. The Temple believes DPT and other entheogens are physical manifestations of God. DPT is a Class A drug in the United Kingdom, making it illegal to possess or distribute . DPT is not scheduled at the federal level in the United States, but it could be considered an analog of 5-MeO-DiPT, DMT, or DET, in which case purchase, sale, or possession could be prosecuted under the Federal Analog Act. "DPT (N,N-Dipropyltryptamine)" is a Schedule I controlled substance in the state of Florida making it illegal to buy, sell, or possess in Florida. DPT is a Schedule I controlled substance in the state of Maine making it illegal to buy, sell, or possess in Maine. ^ William E. Fantegrossi, Chad J. Reissig, Elyse B. Katz, Haley L. Yarosh, Kenner C. Rice, Jerrold C. Winterb. Hallucinogen-like effects of N,N-dipropyltryptamine (DPT): possible mediation by serotonin 5-HT1A and 5-HT2A receptors in rodents. Pharmacol Biochem Behav. 2008 January; 88(3): 358–365. ^ Spratley, Trinette (2004). "Analytical Profiles for Five "Designer" Tryptamines" (PDF). Microgram Journal 3 (1-2): 55. Retrieved 2013-10-09.